(L-R) Usain Bolt and Ellen DeGeneres. Best to think before you meme. 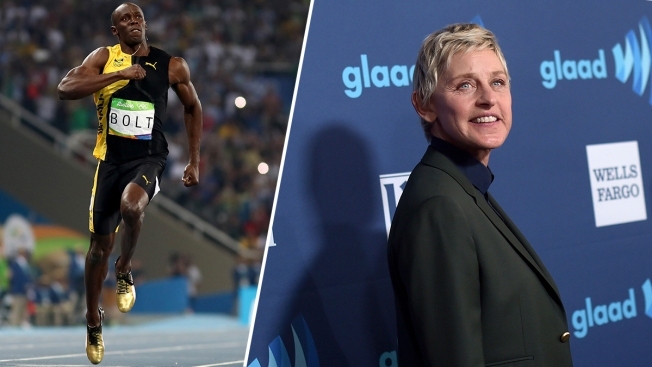 Talk show host Ellen DeGeneres got in on the Usain Bolt meme craze following the sprinter's race for gold in the 100m dash at the Olympics. But her particular choice of meme had some scratching their heads and others crying foul. DeGeneres' meme pictured a photoshopped image of her riding Bolt's back along with the comment, "This is how I'm running errands from now on'" had some criticizing the image of a white woman riding the back of a black man akin to a farm animal. @TheEllenShow honestly this is offensive. DeGeneres was quick to respond, saying she is well aware that racism exists in this country and that "It is the furthest thing from who I am." The ruckus falls on the comedienne's eighth wedding anniversary with Portia de Rossi. Despite the backlash, one person who didn't seem to mind the tweet was Bolt, who retweeted the meme.